Page 2 SPACEPORT NEWS June 13, 2008 Leaders sign Space Act Agreement to help work force during transition K ennedy Space Center Development Board President future missions at the space center. for the transition from the Space It is important that we the aerospace industry. Bus at various locations around the center. contained career center on wheels as well as new sources of other career interests. Rice praised the center for opened channels of communication resource departments. Rood said it is part of the vision to help create and maintain a Brevard County. relationship with Kennedy Space By Linda Herridge Staff Writer It is important that we communicate and work together. Getting started early is the key. Bill Parsons, Kennedy Center Director NASA/Kim Shiett Brevard Workforce Development Board President Lisa Rice, Kennedy Center Director Bill Par sons and Brevard Workforce Development Board Vice Chairman Jack Rood signed the docu ment that will help pave the way for work force cooperation between Kennedy and the BWDB. Transition Working Group seeks to involve everyone To nd out more about the status of the Kennedy Transition, including TWG presentations and minutes, go to: http://ksctransition.ksc. nasa.gov More online P of Kennedy Space Center ramp-down of International Space wide involvement. The Kennedy was chartered in 2006 to provide center leadership in those efforts. transition and retirement are dis cussed. to stay on top of transition issues and develop center positions to ered the most vital and important civil service and contractor person so all directorates are aware of the and any issues that may arise. that every dollar spent on transi tion and retirement is a dollar not items of shuttle personal property located at Kennedy. sessed and cost effective methods developed. for other uses or for closure. tion and retirement efforts are re and notes potential impacts so cen ports to the deputy center director quarterly. 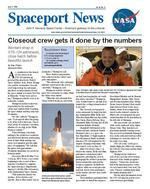 SPACEPORT NEWS Page 3 June 13, 2008 T he technical marvel that is does not stop with the space craft. Spacesuits the astronauts cool. situations. part that everyone sees as astro launch pad is simply the top layer. fully encloses the astronaut in an air the same air pressure as a person That air pressure was chosen to act automatically. dia said. on the suit tells the main parachute ness has water-sensitive devices to detach the parachute when the astro deploy a life preserver around the astronaut in the water. The helmet is equipped with a valve that lets scoop water out of the suit. water. 12 different size suits for its astro several astronauts over the course of many different missions. Spacesuits remain cool despite always-changing fashion trends By Steven Siceloff Spaceport News Shuttle Crew Escape System Manager KC Chhipwadia describes the elements of the helmet that is part of the launch and entry suit (seen on the table) used by shuttle crews during their missions. NASA/Amanda Diller Team prepares Kennedy, CCAFS for new contracts K ennedy Space institutional con tracts Transition Team has for the contract transition. contractor is Space Gateway Support and the KICS con tractor is InDyne. includes services at Ken nedy and Cape Canaveral Air institutional contracts will at Kennedy and seven new director of Cape Canaveral the team is to help provide a smooth and seamless transition to ensure continu ity of services to customers without disruption. There the customer in terms of who Riquelme said infor Kennedy contracts will include Institutional Support ment and Communications Grounds Maintenance and Pest Control. The Kennedy Institu tional Support Services con tract was awarded to ReDenot limited to technical train The NASA Protective to Coastal International Se New contracts at Maintenance and Pest Man Collection and Disposal Support. opportunities where each By Linda Herridge Spaceport News may procure services from the other when needed. Communications Services Support contracts. The NASA Protective Services contract will have a 60-day phase-in period Control contracts will have a 30-day phase-in period A similar phase-in on the dates the new con tracts are awarded. More information will as the new contracts are announced. Riquelme said additional Spaceport News articles and the KSC Daily News Bulletin online. Two e-mail accounts concerns to help ensure a Transition and KSC-KICSTransition. for transition communica so the team can post updated address in the KSC Daily News or a future Spaceport News article. Scene Around Kennedy Space Center Page 5 SPACEPORT NEWS Page 4 SPACEPORT NEWS June 13, 2008 June 13, 2008 You are encouraged to send unique story ideas and exciting photos of workers in action for possible publication. Photos should include a short caption with the names and job titles, from left to right. Send e-mail to KSC-Spaceport-News @mail.nasa.gov. Spaceport News wants your photos Workers maneuver the lightning mast onto the ground on Launch Pad 39B at Kennedy. It is part of the lightning protection system being built for the Constellation Program and Ares/Orion launches. Pad B will be the site of the rst Ares vehicle launch, including Ares I-X. NASA/Jim Grossman for NASA Fifteeen students received their preschool diploma from Kennedy Space Center Child Development Center during a graduation ceremony June 7. About 80 people attended. The graduates are headed for kindergarten. NASA/Cory Huston High school students release a weather bal loon June 6 during part in a ve-day, free pro gram called the Governors School Summer Academy. Funding for the program supports planning to establish a Governors School for Science, Mathematics and Space Technology at or near Kennedy. Page 7 SPACEPORT NEWS June 13, 2008 Sallys ride 25 years ago was a giant leap for women Remembering Our Heritage By Kay Grinter Reference Librarian NASA le The STS-7 crew, from left, Mission Specialists Norman Thagard and Sally Ride, Commander Robert Crippen, Mission Specialist John Fabian and Pilot Frederick Hauck, answer questions from the media at Kennedy on June 3, 1983. A stone in the advancement those trained as test pilots. The new than three. nounced the candidates selected for of a Ph.D. in physics from Stanford Sullivan. American woman in space. They other shuttle systems made her an deploy two communications satel lites the ANIK C-2 for TELESAT Canada and the PALAPA-B1 for trieve the Shuttle Pallet Satellite on Crippen was impressed with that she serve on the STS 41-G mission which he commanded in my missions. And there were no countdown demonstration test launch dress rehearsal. said. and wanted to learn all facets of our attentive and appreciative of our Crippen praised the Kennedy founded in 2001. Its innovative My involvement in the space www.sallyridescience.com.